Image from the Sheriff’s Office’s YouTube page. Check safety/rescue equipment: This includes batteries, fire extinguishers, on-board electronics (VHF radios) and navigation lights. Take life jackets: Make sure you have personal flotation devices (PFDs) for all who will be aboard, and make sure each child wears a U.S. Coast Guard-approved, properly fitting life jacket at all times. Watch the signs: Know how to read the red and green channel markers and watch for “Slow” and “No Wake” signs. These apply to all vessels. Permits and licensing: Make sure you have up-to-date fishing permits and registrations for your vessel. Know size requirements and what fish are in season. Alcohol and boating do not mix: Consuming alcoholic beverages in excess will affect perception, reaction time and decision-making. “Don’t drink and boat!” the release says. 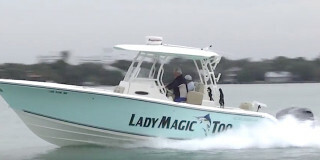 Visit SCSO’s YouTube page to learn more about boating safety: https://www.youtube.com/watch?v=CHZ23nHl-OU.